Hyderabad: Seen in the picture are President of India Shri. 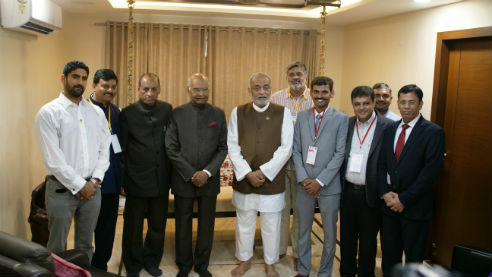 Ram Nath Kovind and Daaji, the Global Guide of Heartfulness Institute at Kanha Shantivanam Ashram, Global headquarters of the Heartfulness Institute ( www.heartfulness.org) , in Hyderabad planting the 100,000th tree. Also present at the occasion was Mr. ESL Narasimhan, Governor, AP & Telangana. This marked the achievement of a major milestone as part of an ongoing Green Kanha initiative by Heartfulness Institute to enrich the natural environment and lessen the destruction caused by human activities and achieving the vision of planting and nurturing of 2,50,000 trees. The Green Kanha initiative emphasises the need to grow ecologically, economically and socio-culturally important native tree species. Kanha Shantivanam is also an ex-situ conservation centre, where rare and threatened plant species are being collected from far and wide within India. Due diligence is being given to the positive ecological role they can play in the decades and maybe centuries to come. More than 300 hundred mature trees that were marked for felling because of roadworks have been rescued and transplanted in Kanha Shantivanam and they are regaining their resplendent form. Another 100 coconut trees marked for felling in Krisnagiri District, Tamil Nadu, have also been transplanted to Kanha Shantivanam.